Steve Jobs was a phenomenon. He went from being an unemployed college dropout to becoming one of the most successful entrepreneurs of all time. 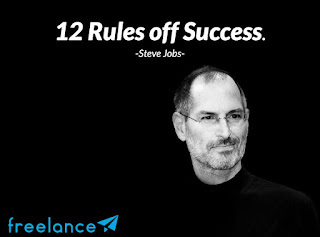 Here are 12 Success secrets from Steve Jobs from his great quotes and wonderful speeches. 2. Be different. Think different. Better to be a pirate than to join the navy. 4. Perform SWOT analysis. As soon as you join/start a company, make a list of strengths and weaknesses of yourself and your company on a piece of paper. Don’t hesitate to throw bad apples out of the company. 6. Start small, think big. Don’t worry about too many things at once. Take a handful of simple things to begin with, and then progress to more complex ones. Think about not just tomorrow, but the future. Put a ding in the universe. 9. Ask for feedback from people with diverse backgrounds. Each one will tell you one useful thing. If you’re at the top of the chain, sometimes people won’t give you honest feedback because they’re afraid. In this case, disguise yourself, or get feedback from other sources. Focus on those who will use your product – listen to your customers first. 10. Innovate. Innovation distinguishes a leader from a follower. Delegate. Let other top executives do 50% of your routine work to be able to spend 50% your time on the new stuff. Say no to 1,000 things to make sure you don’t get on the wrong track or try to do too much. Concentrate on really important creations and radical innovation. Hire people who want to make the best things in the world. You need a very product-oriented culture, even in a technology company. Lots of companies have tons of great engineers and smart people. But ultimately, there needs to be some gravitational force that pulls it all together. 11. Learn from failures. Sometimes when you innovate, you make mistakes. It is best to admit them quickly, and get on with improving your other innovations. 12. Learn continually. There’s always “one more thing” to learn.